A wonderful little silky-haired plant with beautiful colour range of red, white, blue, lavender, pink and purple with yellow centres complete with fern like foliage. 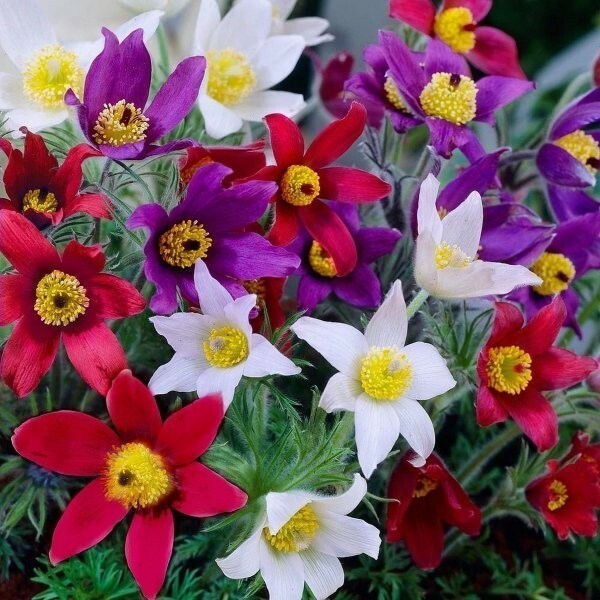 These will look stunning in a rockery or the front of a border to give you some 'cheering up' earlier in the season colour. Attractive fluffy-looking seedheads rise above the plant after flowering, before blowing away like dandelions. These are so versatile and cheerful, winter is barely over and bang, Easter arrives and so do these little beauties. A hardy perennial herbaceous plant that is a must for the garden or equally suitable for pots. Pack of THREE plants in assorted colours (one red, one blue and one white) supplied in approx 1 litre containers, complete with buds and blooms in season.